Yesterday the world lost a really cool guy – Father George Thomas. He’s been a friend of the Blankenheim family for years and a regular at our family barbecues, holidays, and events. Mike and I were blessed to have him marry us back in 2011. He was a wonderful man who gave his life to the church, serving as a priest for over 60 years. His little whistle always caught your attention. He had a great sense of humor and loved to just hang out. Father George, you will be missed – thank you for everything! Requiem aeternam. This coming Friday is officially the four month (16 weeks) post-surgery mark for me. At yesterday’s physical therapy session, I was cleared to run. Still no horseback riding (there’s too much of a chance of that twisting motion and/or an uncontrolled movement), but I’m happy with expanding my activities! I ran today with my sister. We’ve got a little pond at work that has a soft track around it… We started doing a couple laps and ended up doing a mile, with one lap being walked. It was a great start and as the day went on, my knee actually felt looser than it has in a long time (good loose, not missing-the-ACL-loose). I am still having some pain – partially because my IT band and patellar tendon are tight and are pulling my kneecap to the left. Tonight I need to foam roll until I can’t take it and then ice a bit. Here’s what my knee looks like now. It’s healing up rather nicely! 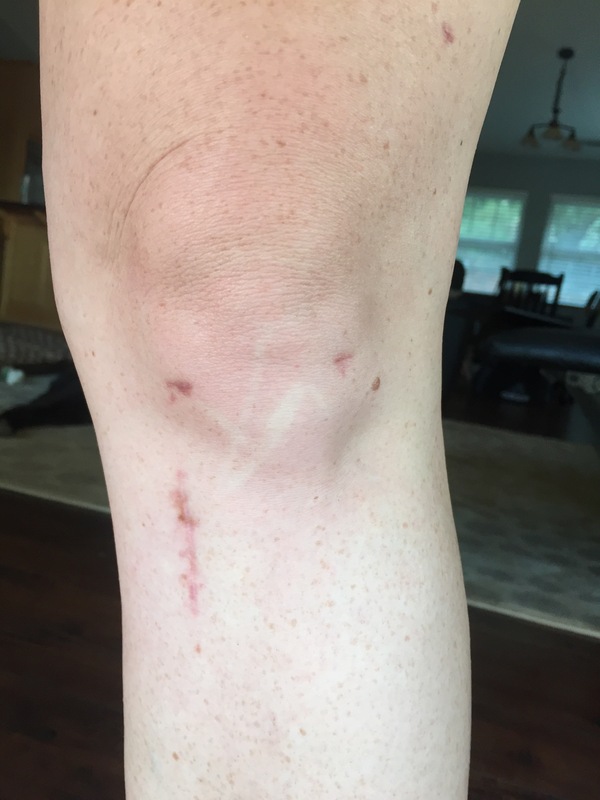 There are 3 “holes” (top right and then two towards the bottom) as well as the larger scar where the hamstring tendon was harvested from. Ignore the white scratch… I was just itchy. I’m really pleased with my recovery so far! Last night I tried a new recipe that I found on Allrecipes.com… chicken wonton tacos. They were absolutely amazing! They’re tiny, so if you have them for dinner, be prepared to eat like eight of them. They’re great as the main dish or would be awesome appetizers! Mix cabbage, carrots, coleslaw dressing, vinegar, soy sauce, and teriyaki together in a bowl; refrigerate until flavors blend, 1 hour to overnight. Heat sesame oil in a skillet over medium heat. Cook and stir ground chicken in the hot skillet until browned and crumbly, 5 to 7 minutes. Add stir-fry sauce, cover skillet, reduce heat to low, and simmer. Form wonton wrappers into taco shapes and arrange between the cups of an inverted muffin tin. Bake in the preheated oven until firm and lightly browned, 4 to 5 minutes. Spoon 2 to 3 tablespoons chicken mixture into each wonton taco shell and top with slaw.